The Propex HS2800 Furnace is a high-output propane gas fired furnace. Pumping out a sweltering 9500 BTU, the HS2800 is like a hot-rodded HS2000. This blown air heating system offers thermostatically controlled heat totally independent of the engine and class-leading energy efficiency. Designed especially for recreational vehicles and marine use. The HS2800 is the most powerful hot air furnace available from Propex. The clever design and advanced electronics makes sure that this high-power furnace is also very economical to run. The average consumption is less than 8 oz of propane per hour. Which means that a 29 lb tank of gas will last 58 hours if left on continuously! This high power furnace packs some clever electronics. The flame, case temperature, combustion airflow, gas solenoid valve and voltage are continuously monitored. In the unlikely event of an issue, the heater will instantly switch off and the red light on the thermostat will flash to let you know there is a problem. By carefully selecting only the highest quality balanced fans and installing smooth enclosed motors with ball race bearings, noise is kept to a bare minimum. The Propex HS2800 Furnace is supplied complete with either a vehicle or marine fitting kit. 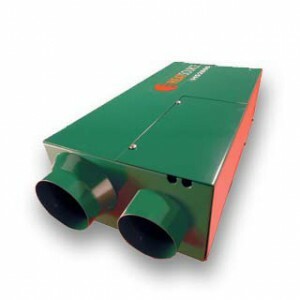 The furnace is usually mounted in a bed-box or cupboard, flued downwards through the floor and out to the side of the vehicle using the flexible stainless ducting. The heat is ducted to one or more outlets through tough highly flexible 2.36 inch (60mm) or 3 inch (76mm) ducting. The marine kit features a stylish and polished stainless steel through hull fitting which accepts the stainless steel pipes for the flue outlet and the combustion air inlet. Eextra ducting and stainless steel bulkhead mounting brackets are also included with the HS2800 marine installation kit. In the case of multi-outlet installations, the first outlet is an open outlet with directional control and the rest are closable and are used in conjunction with the appropriate sized plastic Y-branches.